Hayashi’s striking power may be observed in an ensemble performance of “Shichisei (Seven Stars)” scheduled for Sept. 27 and 28 at the National Theater as part of his production “Jinchi Senkyo (The Power of Human Wisdom Resounding).” The number was first conceived, oddly enough, in 1995 as a commercial for Japan Tobacco’s Seven Stars cigarettes. For the original performance in 1996, Hayashi was given a prize by the ministry of education. In the 13-minute drumming session, the 56-year-old musician will lead 12 members of his Fuun-no-kai group that he assembles whenever needed for performances. 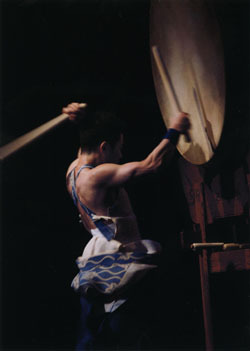 In a typical set, Hayashi stands with his legs apart, lowering his hip and bending backward, while striking the face of the taiko, which is covered with cowhide that has been cured and dried. 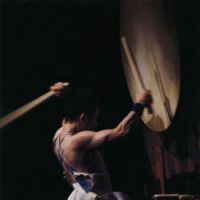 His strength is transmitted to the drum through the sticks carved of hinoki (Japanese cypress). Carved out of a block of a keyaki (Zelkova) tree several hundred years old, Eitetsu’s taiko is larger than the others, measuring 120 cm in diameter. The musician is the youngest of eight children in the family of a Buddhist monk who was a member of a Shingon sect in the mountainous Tojocho in Hiroshima Prefecture. He grew up listening to The Beatles, and originally wanted to become a graphic designer but failed to be accepted at Art University in Tokyo. Living in the city in 1970 to study art, at 18, Hayashi heard on the radio about a summer seminar on Sado Island being offered by the troupe Ondeko-za. On hearing that the designer Tadanori Yokoo, whom he admired, was one of the invited lecturers, he decided to attend. Yokoo did not show up, but Hayashi met Ondeko-za founder Tagayasu Den instead. In his late 30s, Den had reached Sado Island following years roaming around the country after he left Waseda University without graduating. There Den decided to organize a community of young men and train them in traditional performing arts for the purpose of touring the world and, with the profits from tours, establish a university in Sado. The group was to be disbanded after seven years, but went on to become today’s world famous Kodo drumming troupe. A year later, Den, his wife and the nine young men recruited for the project — including Hayashi — began to live together in Sado. Within a year, Den turned despotic, giving his men rigorous rules to follow. He made them run every day from dawn till sunset to train for lessons under first-rate teachers in such performing arts as taiko, fue (flute), shakuhachi, koto, shamisen and Nihon buyo (Japanese dance). They were ordered to avoid alcohol, smoking, women, money, television and newspapers. Den wanted to introduce the members of Ondeko-za to the world by having them run at the Boston marathon and then beat taiko upon reaching the finish line. His idea proved a hit when conductor Seiji Ozawa saw Hayashi running at the marathon in 1975 and immediately asked composer Maki Ishii to compose a piece for wadaiko and orchestra. 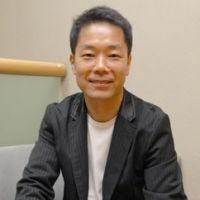 Ishii’s number was played the following year at Boston’s Tanglewood music festival as “Monoprism,” with Ozawa conducting the Boston Symphony and Ondeko-za. Hayashi ended up going to Boston six times to run and give taiko performances. He confesses, however, that it took him a long time to really express subtleties of sound with the varied ways and strengths that he strikes the drums. It was 20 years later that his interest in feeling the colors in sounds brought about a group of fascinating works dedicated to renowned artists such as Ito Jakuchu, Man Ray and Fujita Tsuguji. In the suite “Jakuchu no Tsubasa (The Wings of Jakuchu)” (1999), Hayashi depicts the life of Jakuchu and his unique paintings, rendering rich, dynamic and delicate tones in drumming to suggest Jakuchu’s colors. The piece could be said to reflect Hayashi’s youthful dream of becoming a graphic designer. “Any sound has an expression and a sense of color, and you can feel that color if you listen carefully,” he says. The 11 years spent with the Ondeko-za were difficult for the drummer, but his experiences prepared him for his eventual development as an independent player. The countless tours made abroad in those years helped him find his own ways and work out a new method of handling wadaiko that render subtle, moving nuances. “I believe that the sounds of the Japanese taiko have universal appeal, and there is no need for explanation,” Hayashi says.